Oh how I moan about the weather when it is bad, I can't start moaning now that it is good, can I? Well, I won't suffice to say that of it is too sunny the people, they go to the beach. I do not blame them. I have been sharing some insider info about various things so now here's a bit more. I have to point out at this point that I do not necessarily practice what I preach. I am wearing my gallery owners hat as opposed to my artists hat today. Ok, first things first, do not abuse the fact that gallery owners are a captive audience as they cannot walk away when they have had enough. It will not help your cause. Begging and pleading will also not work. Do your homework, if you are an abstract artist who paints on 10ft canvases thenI the local gallery that specialises in local landscapes is probably the wrong venue for you. It is always nice to know that someone has taken the time to see the kind of work that you show and feel that their work would be a welcome addition. A website is fairly crucial, I will always look at someones website but also I will never accept a booking without seeing the work in the flesh. I like to see the commitment of an artist. If you are a technophobe there are lots of ways to ease yourself in gently and it is a really good investment. Many artists run a blog as a website and update it daily with new works or works in progress. The good thing about this is that you can also share this with virtually all social media websites. Presentation of work in general, bits of paper in a carrier bag that have wonderful images on still won't swing the decision in your favour. Be critical of your own work select 10 pieces that best represent you and then think about how to present them to an audience. A word to the wise I love to see a sketchbook. I like knowing how the art came into existence. Not everyone will but I do. If asked whether you think your work is successful (at this point a typical knee jerk response is to go on the defensive). DON'T! Be honest but stand your ground, err on the side of humility. Don't oversell it but communicate that you are proud of your achievements. Enter 'Open' Exhibitions to boost your exhibiting CV. The more you show, the hotter a property you become. Plan to spend no longer than 10 minutes showing work etc. Don't try and get a free tutorial out of it. Ask for advice about other galleries to try and make sure you thank everybody for their time. Get involved with local art events in your area, more opportunities arise from networking with other artists than you would imagine. 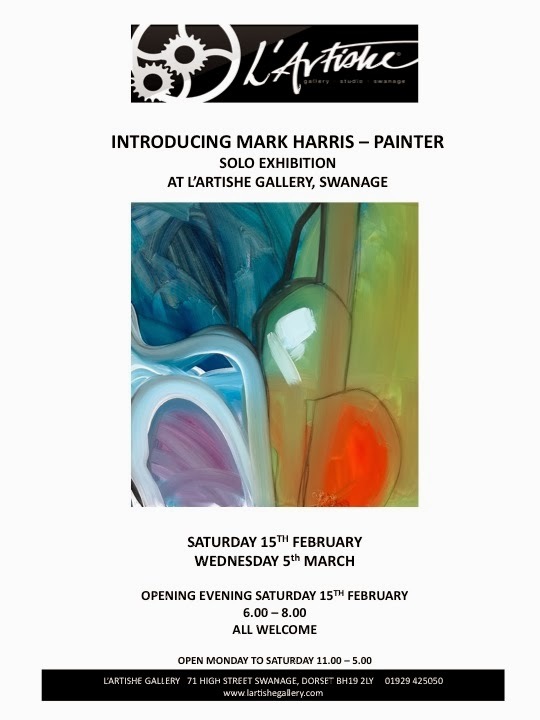 Mark Harris' Exhibition is entering its last few days if you haven't seen it then please do come along. I have checked the weather forecast for tomorrow and it promises to be quite nice. A stroll, a hot cuppa and a bit of art appreciation, how can that be a bad way to spend your Saturday? Oooh especially if followed up by fish and chips. Yum! Commercial Artist or Fine Artist? You Decide.